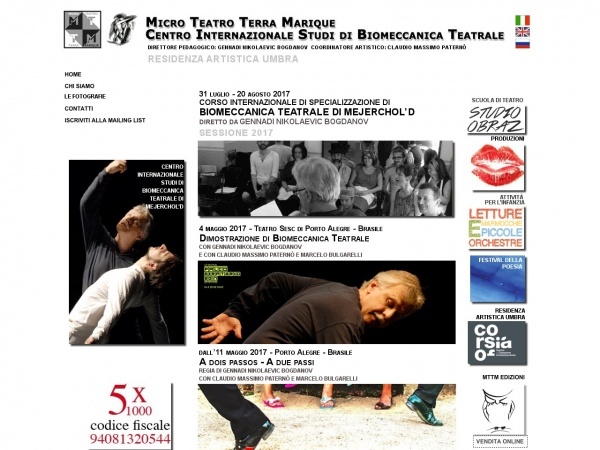 International cultural association Micro Teatro Terra Marique – International Center of Theatrical Biomechanics was founded in 1998. During its initial 5 years it was modified different times until it finally found its proper identity meeting with the Master Gennadi Nikolaevic Bogdanov. After the first phase of total closeness (birth of the Micro Teatro) and studies and the choice of the technical base theatrical biomechanics of Meyerhold (international center of theatrical biomechanics), association has decided to open and make well known the proper art (terra Marique, in Latin means everywhere ). From 2004 the principal aim of the C.I.S.Bi.T. is to take forward the artistically heredity of Vsevolod Emil’evic Meyerhold and to preserve the tradition of the educational system of theatrical art – Theatrical Biomechanics. The act of foundation of this new phase was organization of the conference theoretical-practical “”Actor-Composer”” at the oratory of Santa Cecilia of Perugia, that made well know to a public what is it the theatrical biomechanics.